A new technique for color-coding nerves involved in touch gives neuroscientists a much-needed tool for studying that mysterious sense. For nearly 250 years, the intricate detail and complexity of skin’s nervous-system wiring has thwarted attempts at understanding it. But if researchers studying skin could be imagined as technicians reverse-engineering a supercomputer’s peripherals, they’d have just traced about four lines back to the motherboard. Over the centuries, anatomists and physiologists have found some two dozen unique types of nerve endings — the cellular contact points between a body and its external world — in the skin of mammals. But until recently, researchers could only speculate about the function of most nerve endings, much less explain how brains process their signals. More obstacles to decoding touch are clusters of tissue called ganglia. Located near the spinal cord, each houses the cores of hundreds or even thousands of super-long nerve cells. They’re like black boxes for biological wiring. To untangle the wiring, Woodbury and other researchers led by neuroscientist David Ginty of Johns Hopkins University began with mouse nervous systems. They focused on a class of nerve endings called low-threshold mechanosensory receptors, or LTMRs, which are sensitive to the slightest of sensations: a mosquito’s footsteps, a hint of breeze. 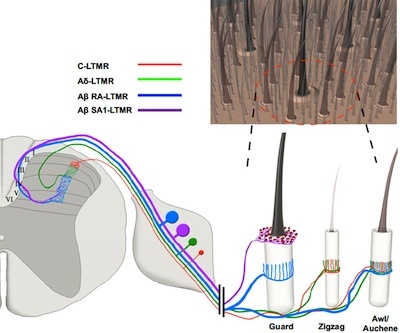 The researchers identified genes active only in types of LTMRs at the base of ultra-sensitive hairs. 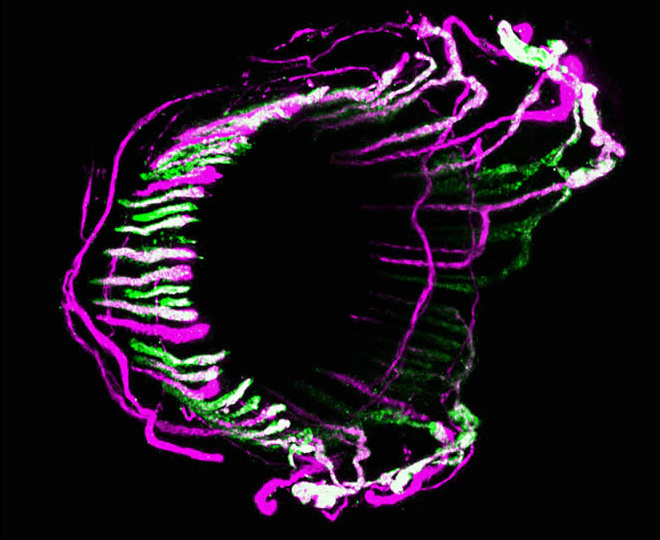 Then, in mouse embryos, they tagged those genes with fluorescent proteins. The result: an engineered mouse strain illuminating the full, precise paths of LTMR cells. Under a microscope, the researchers tracked three different types of LTMRs in never-before-seen detail, plus a fourth well-studied type. “This enabled us, for the first time, to nail down and tie specialized nerve endings to functions,” Woodbury said. By following LTMRs all the way into ganglia and out the other side into the spinal cord, the researchers discovered a layering pattern that resembles the organization of neurons in the cerebral cortex — the outermost layer of the brain with major roles in consciousness, memory, attention and other roles. With four of the two dozen different nerve ending types now traceable, the researchers are now working to tag the rest. Someday, perhaps, their technique could lead to complete neural maps of touch.